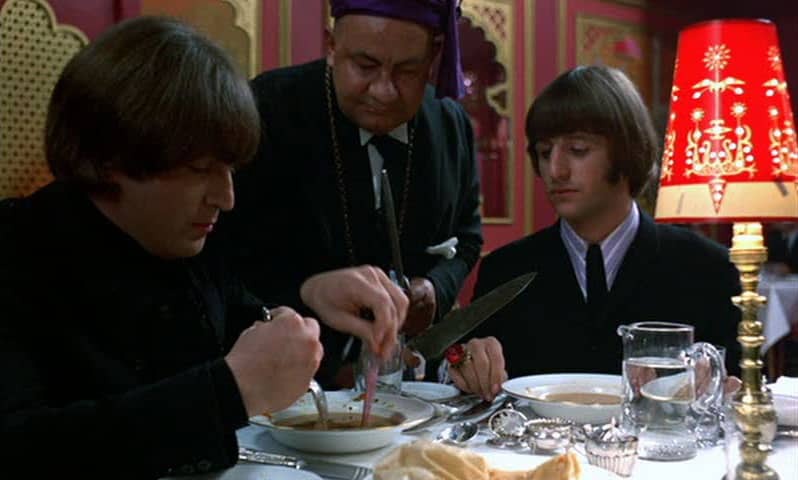 The Beatles completed the interior kitchen and dining scenes for the Rajahama Indian restaurant sequence in Help! on this day. The scenes were filmed on a set at Twickenham Film Studios in England. During a break while filming, the group saw traditional Indian musical instruments for the first time. George Harrison, in particular, was fascinated by them, and the music had a significant effect on The Beatles' musical development. Also on 6 April 1965, television talk show host Simon Dee presented The Beatles with a Bell Award from pirate station Radio Caroline. The Beatles, however, proved disruptive by ringing the bell during inappropriate moments during the presentation. The event was filmed by news reporters, and Dee also interviewed the group for Radio Caroline.